If there is someone in your home who has lost mobility, it is important to modify your house to make it more accessible. One great choice for allowing someone in a wheelchair to get to every floor of the house is to install a home elevator. However, when the elevator is no longer needed, it can easily sit unused. Your home elevator does not need to be rendered useless when you no longer need it. Instead, you can repurpose it so you can get your money’s worth from it. Below are some great ways to use your home elevator after it has finished servicing its initial purpose. Laundry. 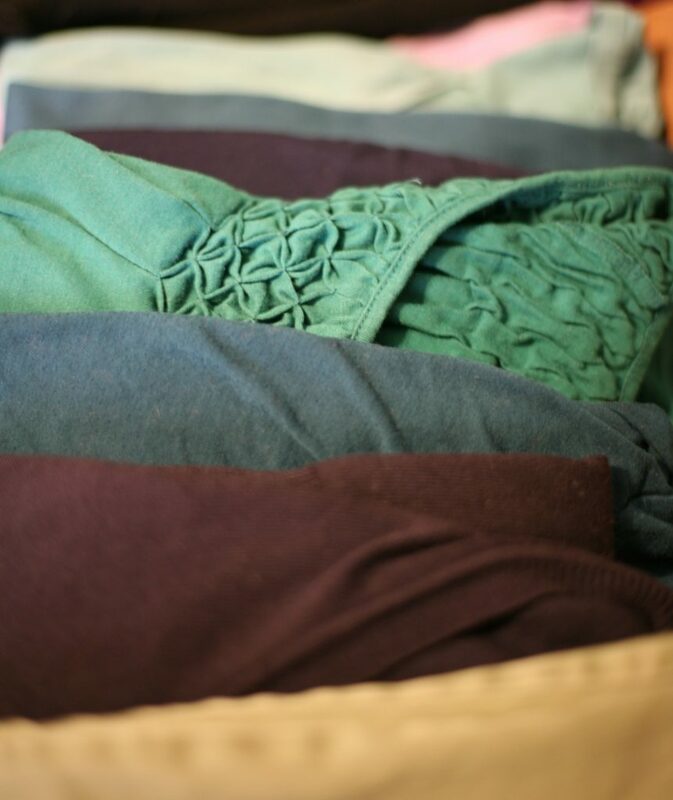 Anyone who runs a household can tell you that doing laundry is a never-ending process. It often seems like as soon as the week’s laundering is done, the next week’s starts. Plus, if bedrooms are on an upper floor and the washing machine is on the first floor or basement, you need to tote heavy baskets full of clothes down at least one flight of stairs. Then, once the laundry is done, you have to reverse the process by bringing the clean clothes up. Having to complete this process regularly can be cumbersome and tiring. But, if you have a home elevator at your disposal, you can use it to help you with all of the toting. You can put all of your laundry baskets in the elevator at the same time and send them down to the laundry room. This method saves you a lot of time and effort. So, you can get your laundry done in a fraction of the time without having to struggle carrying the baskets all over the house. You can use the home elevator to reduce trips with any heavy items. Sleeping babies should not be disturbed. Taking a baby upstairs to his or her crib can be a tricky feat. As you traverse a flight of stairs, it is easy to jostle the baby awake. Plus, you need to either hold the baby with one hand and the railing with the other or hold the baby securely with two hands and hope to not trip up the steps. Either way you choose, you are risking the safety of both you and your baby. But, if you use a home elevator, you can safely take your sleeping baby upstairs soundly and safely without having to worry about waking your sleeping child. If you have a home elevator that you no longer need to use, you do not need to worry about it wasting space in your home. With a little ingenuity, you can find new uses for it and still let it be a part of your everyday life. 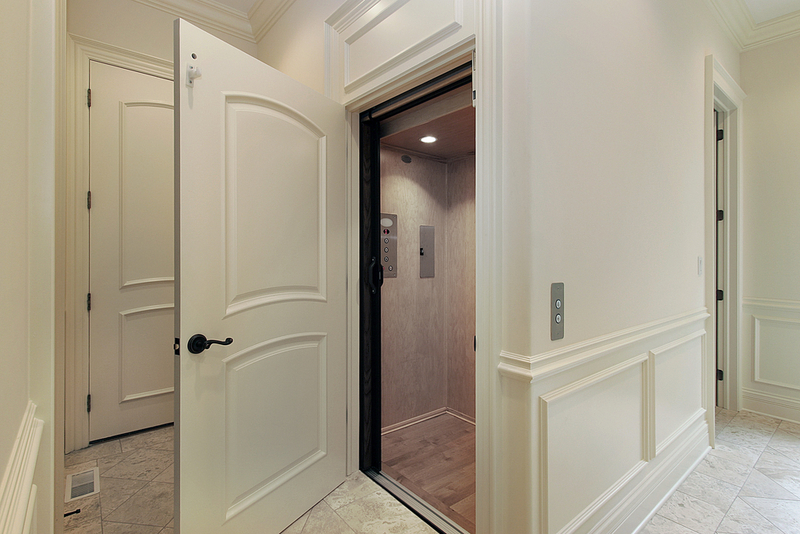 If you have questions about home elevators, contact Lift and Accessibility Solutions today. As we and our loved ones age, mobility begins to become more of an issue with each passing year. Old injuries, the progress of arthritis, loss of balance, and various other aspects of a normal aging process start to limit what we can do and where we can go, even within our own homes. Persons with physical disabilities may also find that they are unable to move freely throughout their home and need some extra help getting around. For many, installing a lift in their multi story home restores a great deal of their mobility and independence. 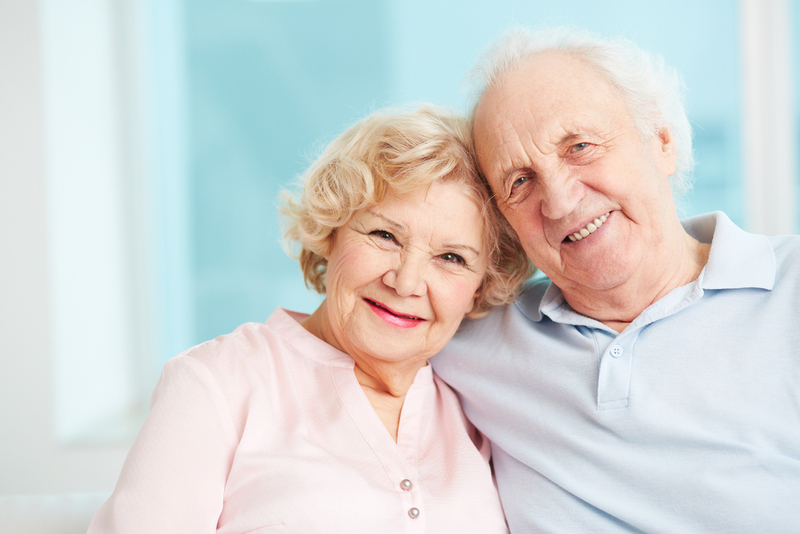 Let’s take a look at the different types of lifts and how each can help seniors and the disabled regain both their mobility and their freedom to move around their home. Quite possibly the most popular accessibility lift option, stair lifts offer many options and features that allow installers to customize them to the individual needs and home of the user. A sturdy rail support with a folding seat is installed on the wall of a staircase leading to the floor to which the user needs easier access. 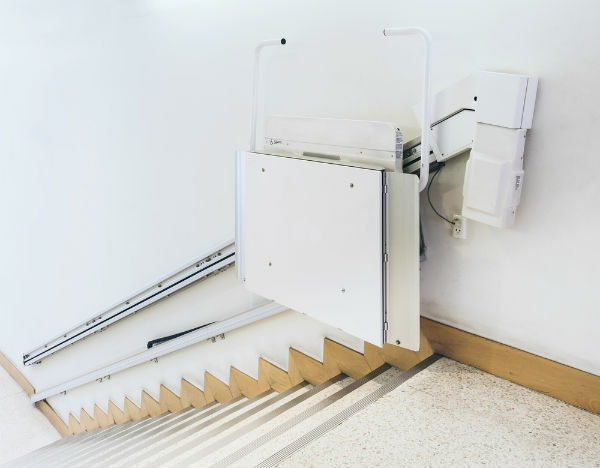 Powered by an electric motor, these lifts allow anyone to sit on the folding seat and ascend or descend the staircase without needing to climb the steps themselves. Stairlifts and accessories can also be matched to the decor of your home without compromising the style or aesthetic as well. Best of all, in addition to being one of the most versatile home accessibility lift options, stairlifts are also among the most economical options, too. While somewhat bulkier than stairlifts, wheelchair lifts offer the ability to make every floor in your home wheelchair accessible. Like a stairlift, wheelchair lifts have a folding platform mounted to a sturdy rail system installed in the wall of the staircase. Users unfold the platform and maneuver their chair onto it, usually securing themselves and their chair via an installed stability bar or similar mechanism. All that remains is a push of the “up” button, and they can be on the second floor independently in seconds. Wheelchair lifts can also be customized to better suit the decor and aesthetics of your home, allowing you to make them less visually obtrusive. For those who have stairways too narrow for stair or wheel chair lifts, personal elevators make an excellent option. These unique lifts do not require a shaft to function, and can be installed directly through floors to reach levels of the home above or below them. These are an exceptionally quiet and safe option for users who use a wheelchair or for whom stair climbing and descent are no longer an option. Personal elevators also allow users to place them more discreetly within their home to keep their interior design and decor intact, too. While they are probably the most efficient option that requires the least amount of home renovation, they can be significantly more expensive than stairlifts or wheelchair lifts. All in all, no senior or person with physical disabilities need limit their independence due to a loss in mobility. A stairlift, wheelchair lift, or personal elevator restores your personal independence and make every floor of your home easily accessible once again. We have all experienced that sinking feeling when you walk in a building and head toward the elevator and see that out of service sign. That feeling of annoyance is fleeting once you have left the building and gone about your day. Now, imagine if it were your home elevator that was broken. That feeling of annoyance would sit with you until it is repaired. Along with that very real emotion that comes with feeling like you are cut off from a portion of your home. Well, with that in mind here are a few simple things to keep in mind with your home system. Not doing these things will help keep it running smoothly for the extent of its life. Having an elevator may seem like an easy way to take heavy loads from one floor to the next. Yet one of the fastest ways to shorten the life of your home elevator is by running your system overcapacity. This forces every part of your elevator to work harder to make the lift from floor to floor. If you run your elevator overcapacity regularly you will likely begin to notice that it will start to run at uneven speeds. Do not interfere with the doors of your elevator as they close. Blocking your elevator doors might seem like a good idea to “hold” the elevator to get everything or everyone in the lift. But in fact with many newer elevator lift systems you can “time out” the elevator by holding the doors open. The resulting “time out” will then need to have a mechanic restart the system. If you need to keep the doors open longer than programed use the DOOR OPEN button that should be located on the selector panel. So, we all have been there as a kid and likely many of us have as adults as well we are in the elevator and it is descending to the ground floor. Just as we sense it is about to come to a stop we jump up and down. Well, it sure sounds fun and it was when were kids but unfortunately this action is very hard on your elevators lifetime as it puts stress on numerous parts of the lift. So, don’t bow to the temptation yourself or allow other people using the elevator to. Lastly it may seem like common sense but never try to pry open the doors while in the elevator. If you do manage to force the door open you can risk injuring yourself. Additionally, by forcing doors open you can damage the system resulting in the need for time consuming unnecessary repair to your elevator. Architects have long debated how important a building’s design is. Some have come to the conclusion that the appearance of a building is just as important as its purpose, or perhaps even more so. Others hold the opinion that form must follow function- a drafty and leaky building will fail to adequately protect its occupants, regardless of its visual beauty. A related principle stands out either way: if the intended occupants of the building can’t access it easily, then the building has clearly outlived its usefulness. This is as true for individual houses as for grand civic structures. All buildings are a means to an end- that of shelter from the elements- but there’s something special about a home. Most of us spend the majority of our time in our homes, and frankly, we’d rather be there than in the office, because home is where the heart is. It’s where family is, and where many of our best memories are made. It’s a place that we want to associate with rest and enjoyment. Of course, we don’t remain the same during our entire lives. People grow and change, and adapt to new circumstances. Often our homes start to represent something different in the context of those changes. Buildings don’t simply adjust themselves in the way their occupants need. Many buildings that were once of great use to thousands of people are for this reason abandoned to the elements, but who wants such a fate for their beloved home? Anyone who has invested so much time and effort in the beautification of their home would hardly feel satisfied with such an end, even if the staircase has lately become more of a burden than a help. Fortunately, human ingenuity has now made it easier than ever before to adapt a home to the changing requirements of life. Technologies like motorized chair lifts can bypass the steps of any staircase, regardless of shape. That key feature of a multistory home no longer need imply the wearing down of its user’s knees, or demanding the assistance of another resident. A more attractive but more design-intensive technology like a home elevator can accomplish the same useful purpose of improved accessibility, while adding a customized touch of architectural sophistication. Above all, they provide a home’s occupants with that cherished feeling of independence. Having outdoor steps turned into a ramp, installing swing away doors, widening doorways, lowering thresholds, and installing grab bars are also important and simple ways to adapt the home. Our houses are, as one architect put it, “machines for living.” They should serve us, rather than wear us out. Even so, we feel attached to them, and we want them to be places where we can be happy and comfortable for many years. A proud and independent homeowner would therefore do well to consider the value of these adaptations that can help a house remain a home. For people with certain disabilities, those suffering from conditions such as arthritis, or those who use wheelchairs, one part of a house presents an insurmountable obstacle: stairs. If your home has multiple levels (think San Francisco, CA) and it is starting to become difficult or impossible to make it up the stairs, it is time to look for other solutions. Many people, when they encounter this situation, have to restructure their lives to ensure that they can spend all their time on the lower level, often because they don’t know that there is another option. Others understand that there are steps you can take to alleviate the struggle of getting up the stairs, but think that it’s too expensive and give up on the idea. However, if you want to change the way that you move around your home, at least one option is definitely on the table: installing an elevator. Though many people get scared off by the seemingly high cost and the large nature of the project, in reality it can definitely be affordable for people of different incomes and backgrounds, and can be accomplished in a relatively short period of time. So what can a home elevator do for you? For starters, it can help people who are in wheelchairs move around their house by providing a moving platform that can get you up from a first to a second or even a third level, or down to the basement. Whether you have had an injury, an accident or are experiencing the effects of old age, an elevator can help alleviate the pain of getting up the stairs and can make you feel comfortable in your own home again. Furthermore, elevators actually increase the value of a home once they are installed – so you can actually reap the benefits of greater property values as a result of your investment. If you want to install an elevator in your home, you have a choice between a hydraulic and pneumatic elevator. The first option is generally larger and more expensive, but is also quieter and generally more popular. Hydraulic residential elevators are driven by a physical elevator arm that lifts people and objects up and down, and these elevators often have room for multiple passengers. Pneumatic elevators, meanwhile, are smaller and less expensive, and though they are less well-known they are slowly growing in popularity. They also have a glass exterior, which helps the home look more modern. On average, installing an elevator requires an investment of at least $20,000, which includes the cost of the elevator cab and mechanism itself as well as installation. 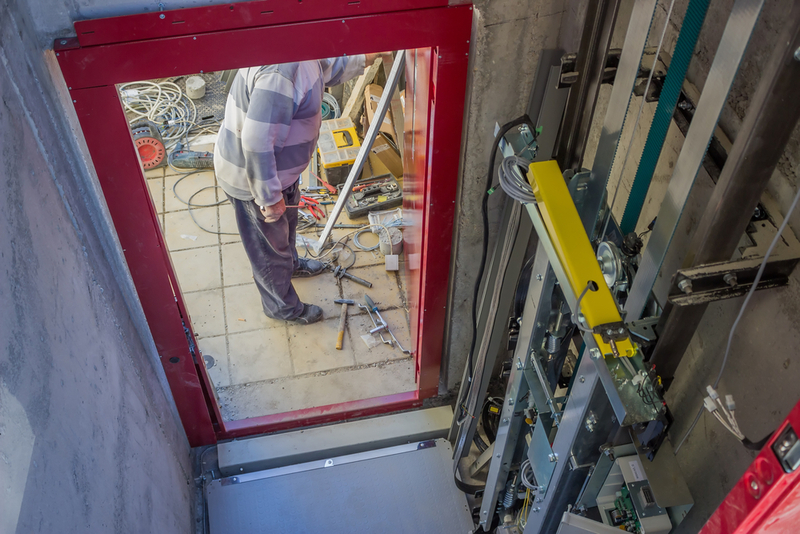 If you are interested in installing either an elevator or lift into your home, it is important to spend some time weighing the pros and cons of each. Factors such as cost, capability and ease of install, need to be a part of your decision. Keep these aspects in mind and choose the machine that is right for you. A lift, also known as a platform lift, is a powered device that is designed to raise an occupant, most often in a wheelchair or other assisted device, over a vertical barrier such as a high step or a flight of stairs. They are often installed in homes and businesses and are often found on public transportation vehicles, including public buses and trains as part of the requirements of the Americans with Disabilities Act. Elevators are an alternate option. Residential elevators have the ability to reach at least two floors in your home. The construction involves installing a shaftway, which encloses the cab, and the machinery needed to manipulate elevator. Elevators are ideal in homes where more than one person will need to access a higher floor simultaneously as elevators are capable of handling much more weight than a lift. The good thing about elevators is that they can be constructed in a variety of designs so they are an excellent choice for multi-floor transport. If you are thinking of installing an elevator, there are several factors that you will need to understand so that you pick the proper option for your situation. When it comes to cost, lifts generally cost much less than elevators. Elevators also require more construction and equipment than your regular one person lift. On the positive side, elevators can have a sleek appearance and transport multiple individuals at once. 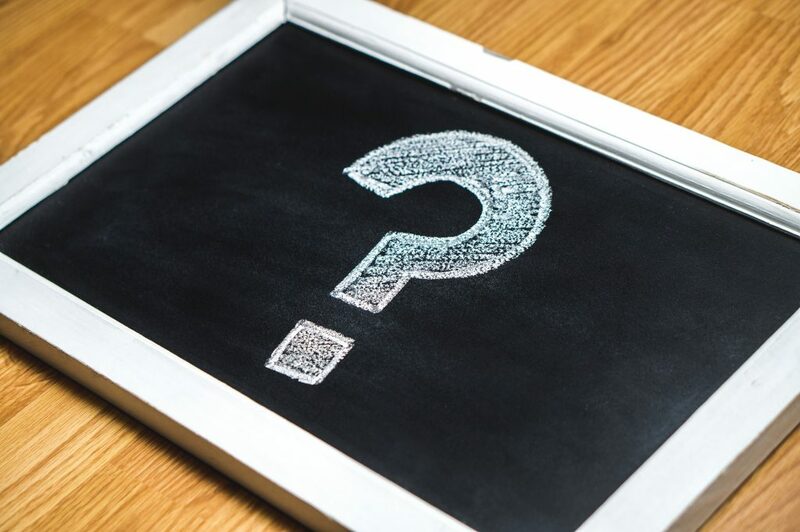 There is a lot of thought that goes into deciding whether an elevator or a lift is the right option for your San Francisco, CA home. Regardless of your choice, know that either option is an excellent fit for almost every home. If you’ve recently experienced an illness or injury and now have to use a wheelchair, you will probably have some difficulty adjusting to living in the same area you occupied before, especially if you reside in a two-story home or apartment. Although regular residences pose their own problems, two-story residences are particularly difficult because you have to deal with the issue of figuring out how to get your wheelchair up and down stairs and to different levels in the home. Although the task may seem daunting, it is important to remember not to give up; plenty of products and services exist to help wheelchair users move about their homes with relative ease, including between floors. Take a look at the following examples of wheelchair lift options for your residence, and you can begin to consider which works best for you and your home. A vertical platform lift is a simple platform, large enough to fit your wheelchair, with a mechanism that moves it directly upwards to heights of up to 14 feet. Generally, vertical platform lifts are used to help wheelchair users ascend from a base level to a porch, raised deck, or other type of short level that otherwise would involve climbing stairs. They can be installed indoors or outdoors, and generally tend to be simpler and cheaper than home elevators or stair lifts. A home elevator is the next step up from the vertical platform lift; it works by moving your wheelchair vertically upwards, but is usually fully enclosed and is often used to move between different floors rather than to a raised deck or porch. These are especially helpful if your home is very large and a vertical platform lift may not be able to accommodate going up one or more floors; however, they are also often pricier and harder to install than the other types of lift options. Stair lifts are used specifically to move wheelchair users along a flight of stairs, rather than in an exposed area such as a landing. They work by moving a platform containing a wheelchair diagonally up the stairs, and generally are easy to use and install because they do not take up any extra space other than what your stairs already occupy. Life is all about experiences. Many are willing to pay top dollar for the best in all aspects of life. Having the best things in life is a luxury many strive to have. Not all of us are in a position of acquiring luxury items to make our lives easier. Fortunately, you no longer have to be rich or live in a mansion in order to indulge in freedom of mobility. With the Stiltz lift, you can now have your own personal elevator in your home. Stairs are no longer the only option! Serving many homes in Sonoma County, residents are taking advantage of the new experience. After all, who doesn’t want a taste of the finer things in life? Stiltz brand is the top company in home elevator installment in Sonoma County. Since their beginnings in 2010, the company has grown to offer their home elevators in various countries, while offering the same quality services and delivering their product all the same. Developed by a team of highly experienced engineers, the first model of Stiltz home elevators offers a unique functionality for a residential product. Particularly in the U.S., a new office was opened in Allentown, PA to meet the high American demand. Along with it being a luxurious addition to your home, Stiltz home elevators are installed with ease. Taking as little as two days to install, the self-sufficient appliance will be available for use in your home in no time. Don’t worry about your walls being able to take the load of your elevator as it is self-supporting and won’t need to be affixed to any walls. As far as powering the device goes, it is as simple as plugging the power cord into an outlet. Ironically, Stiltz home elevators actually run on less electricity than many home appliances; high-energy bills will not be a concern. 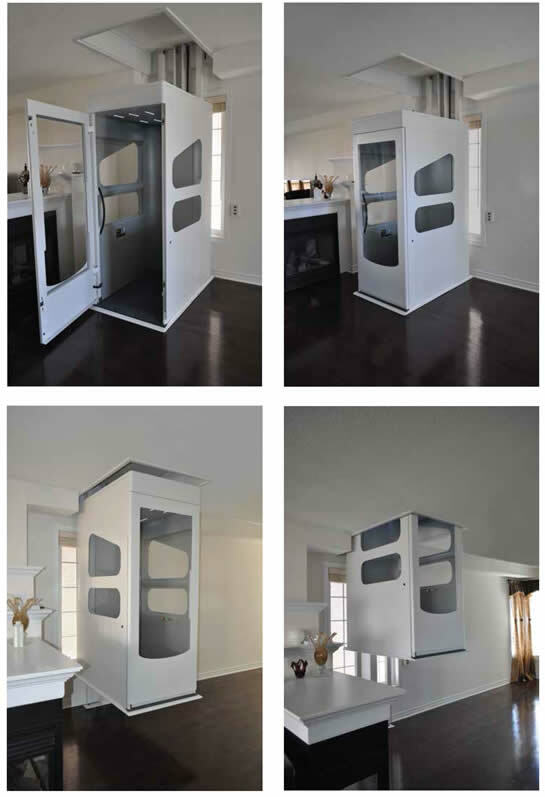 With its unique versatility, Stiltz home elevators can be installed in various types of homes. Capable of fitting in small spaces, only seven squares of feet are needed for the elevator to be added to your home. In short, more times than not you will be able to have your own home elevator in the location of your choice. Otherwise, a separate, more suitable location will be suggested to place the elevator in your home. Not to mention, thanks to its mobility and self-sufficiency, it is possible to take your home elevator with you if you choose to move. Such a factor only makes the decision easier to call for a quote! 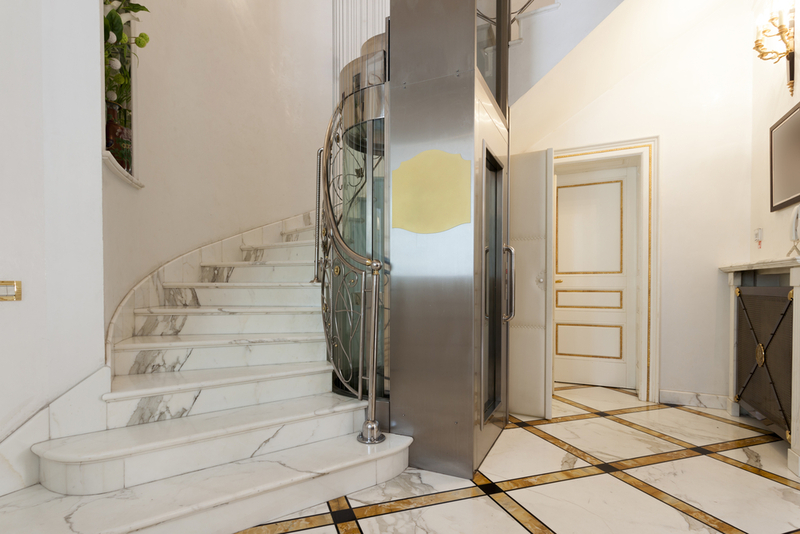 Do you know that until fairly recently home elevators were a luxury item for a select few? As prices of residential elevators are more affordable and technology has improved installing one at home has become quite popular across the country. People install elevators at home for numerous reasons, but these five benefits are universal to everyone interested. For many people, installing a home elevator is an added benefit when reselling their property. Many prospective buyers are attracted to homes with elevators making it a profitable investment for homeowners. These buyers may be interested in future mobility or have a family member in need of the elevator. Regardless of the explicit reason, having one can increase your home’s desirability and equity. Does anyone really enjoy carrying heavy objects up and down stairs? With a home elevator, once tiresome chores are made immediately easier. For others, climbing the stairs can be a challenging activity. By installing an elevator in your home, people confined to wheelchairs or the elderly will have no trouble accessing the higher floors. Not only is it easier to get up and down, a home elevator makes doing errands and conveying objects simpler and more efficient. When compared to a stairwell, elevators take up much less space. Homeowners who decide to make the investment in a home elevator are able to increase the useable square footage of their home providing more options as well as increasing the resale value. The elevator shaft only takes up a portion of the size of a staircase and if maximizing space is your top priority, elevators can be installed on the outside of the home providing more entry points. Since residential elevators are becoming increasingly affordable and available, many homeowners are looking to them to add both a unique look to their property and increase its functionality. It could help your home set a new trend in your neighborhood by being the first to install an elevator. 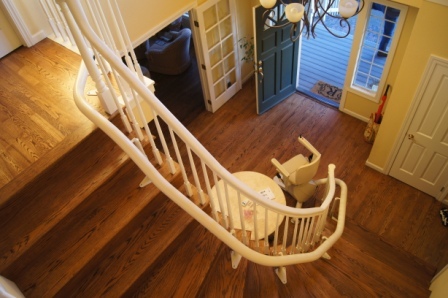 One of the most common ways people are hurt in the homes is from the staircase. A home elevator not only protects young children and adults who are frailer, it can help everyone stay safer. There is virtually no risk to riding your residential elevator as compared to running up and down the stairs. We hope these 5 benefits to installing a home elevator have helped you. Do you have any question? Please contact us today! Hello, my name is Paul Harlin with Lift and Accessibility Solutions. We’re here at a client’s home in Windsor, California where we recently installed a Stiltz Personal Elevator. Now, the personal elevators have a smaller footprint than a conventional residential elevator, but more importantly they also don’t require a shaft. So we’re not taking near as much of the volume out of a room when we put an elevator like this in the corner of the room. When I run this elevator up, this is what makes it so special. The only thing that’s going to be left in this room are the two stilts, these triangular supports that the elevator is running up and down on. We can still look out the window, we still have the volume of room in the dining room. We can still sit down and have Thanksgiving dinner which would be next week. I hope this is a new product that piques your interest. And if you have any questions, please feel free to contact us at the information below.